Clemson University microbiology major Hayley Hassler, a junior from Hartsville, S.C., works with a petri dish containing Legionella clemsonensis, a strand of bacteria named after the University. The Centers for Disease Control and Prevention (CDC) gave the honor of naming L. clemsonensis to students in a collaborative research group called CU and the CDC, which includes students from Clemson’s Creative Inquiry (CI) program for undergraduate students and officials in the CDC Legionella lab. The newly named strain of Legionella was part of a batch of 68 strains the CDC sent to Clemson students to analyze. “While we knew they were Legionella, they didn’t match up to anything in the current database of bacterial species. It’s like knowing their last name but not their first names,” said Tamara McNealy, an associate professor of biological sciences who forged the collaboration with Claressa Lucas, director of the CDC Legionella lab, to characterize unknown Legionella strains. Undergraduates in the CI group — Joseph Painter, Kyle Toth, Kasey Remillard, Rayphael Hardy and Scott Howard — sequenced two genes at the Clemson University Genomics Institute to identify the species or to find out if they were novel. “One of the strains Joseph was assigned turned out to be novel or not significantly matching anything in the database,” McNealy said. A second wave of students, including Hayley Hassler, a junior, and Allie Palmer, a master’s student in McNealy’s lab, along with Vince Richards, an assistant professor in the biological sciences department, worked to validate that L. clemsonensis does indeed fall separately from the other known Legionella strains. A sample of the Legionella clemsonensis bacteria under a ultraviolet light. The bacteria can be seen as small glowing dots in the 12-o-clock area of the petri dish. According to the CDC, L. clemsonensis was originally isolated from a patient in Ohio. Preliminary analysis showed it was not L. pneumophila, the most commonly identified pathogen in the group, and that it didn’t fall into any known grouping, McNealy said. 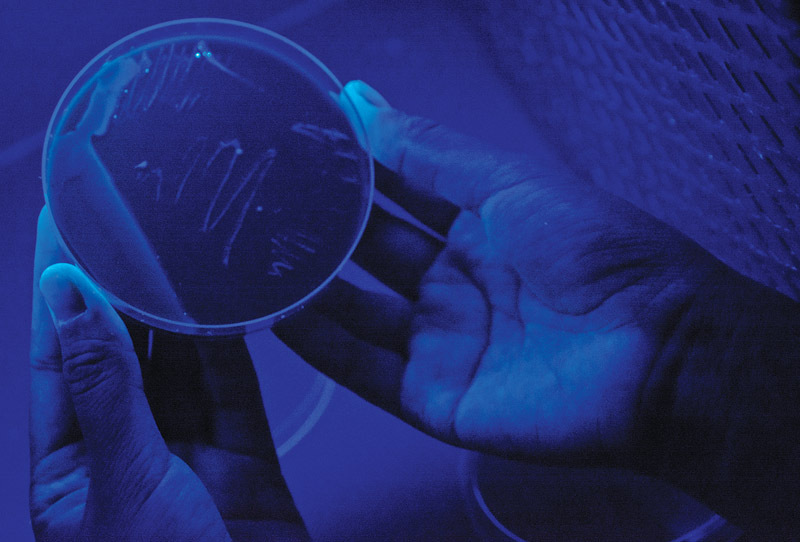 Another feature that set this strain apart: When hit with ultraviolet light, many Legionella strains fluoresce blue, red or yellow, but L. clemsonensis fluoresced green. If Legionella is inhaled by someone who is elderly or immunocompromised it could lead to a treatable form of pneumonia. The bacteria live in biofilms of all manmade water systems and are found in freshwater lakes, streams and rivers. Around 4,000 to 5,000 cases of waterborne bacterial outbreaks are reported annually in the U.S., an estimate that is probably low, McNealy said.